Our model is designed to make an immediate and lasting impact. We are a one-stop source of solar energy experts who can help organizations take their ideas and make them a reality. 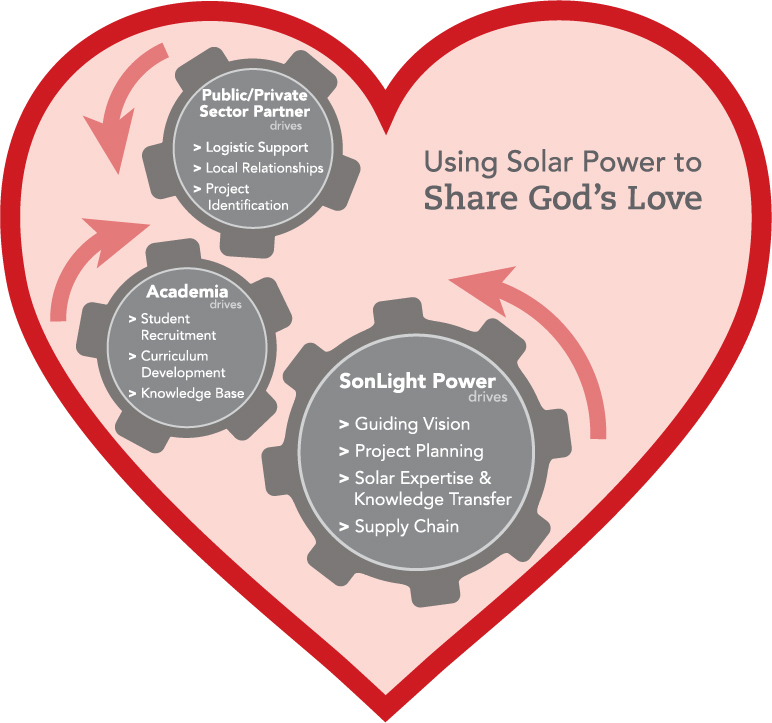 If you want to equip your mission with solar power, we can help. If your church has adopted a peer congregation in Honduras or your organization aspires to bring electricity to a medical clinic in Haiti, we can help you mobilize a mission team. We have over 16 years of experience and have designed more than 190 projects, mostly in Latin America and Africa. Our model is cost-effective and scalable. We have a solid supply chain, strong international partnerships and access to experienced solar installers and engineers with a heart to serve. Innovative multilateral alliances with academia and partners in the private and public sectors have paved the way for SonLight Power to broaden access to energy and educate the next generation of solar experts - all at low cost. In Honduras, our program has been recognized as a center of excellence by the U.S. Department of State. We have trained over 50 engineering and sustainability students from Honduran universities. Projects installed there provide hands-on learning opportunities that supplement class instruction. Students have gained valuable community service experience as they apply their skills to new projects. Universities benefit through their ability to design an enriched and relevant curriculum. Students get an immediate benefit from their education while SonLight Power secures the equipment and human resources, completing projects on time and at a lower cost. Our model includes training the next generation of solar experts in areas we serve. Our teams work together with our in-country partners to ensure they are equipped with the knowledge and skills needed to use, maintain and care for their systems over time.